The Marsee Mighty Mini tank bag is about as small as you can get. It should fit just about any size fuel tank. It’s fully lined, nicely made and the zippers have big pulls. Is this the world’s smallest — and cutest — tank bag? “Cute” isn’t a word that you see very often on webBikeWorld. It’s not because we aren’t sensitive and in touch with our inner selves — it’s just that the word “cute” is too… well, let’s just say that it’s not scientific enough and we’ll leave it at that. But cute is the word that just about everyone — man and woman alike — has used to describe this Marsee Mighty Mini tank bag. So I guess we’ll go with it! Yes! It is cute — there, I said it! It’s also tiny, at only 215 mm (8-1/2 inches) long, 115 mm (4-1/2 inches) wide and standing about 150 mm (6 inches) tall. It weighs a miniscule 329 grams (11.625 oz. ), but it has all the features of its bigger brothers and sisters in the Marsee line. Get one while you can — Marsee has recently changed the very popular Mighty Mini, but our feeling is that they should have left well enough alone. Just like a modern-day SUV, the new iteration of the Mighty Mini has gotten bigger and fatter and, we think, less useful. But there are still plenty of the older models (shown here) available, either through online sources or at your local motorcycle shop. We found this one hanging on a wall in the back of the shop, all by its lonesome, and couldn’t resist. I’m not sure if the pricing has changed also — this version cost us $60.00, which seems like a lot of money for a 3-liter tank bag, but the revised version lists for $119.00. Yeeeow! That’s way too much, in our opinion. The revised version gives you a zippered base that allows you to remove the Mighty Mini whilst leaving the mounting straps attached to the motorcycle. But our version is so easy to install and remove that we don’t really see the value. It also has a hand carrying handle on the front, which makes it easy to transport when detached from the bike. The Mighty Mini has lots of room inside, and its shape maximizes the amount of relative storage that can be had, considering its dimensions. The main internal storage bay is fully lined, and it can be accessed by unzipping an almost-full-length zipper. The zipper pulls are huge, compared to the size of the tank bag itself, but in our opinion, zipper pulls can’t be big enough. 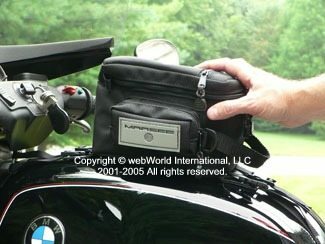 Big ones make it easy to use the tank bag when wearing heavy motorcycle gloves. You do wear motorcycle gloves when riding, right? I can easily fit four half-liter bottles of water in the Mighty Mini, or a bottle of water, a camera, cell phone and a few other goodies. It will hold a compacted rain jacket, and I can even fit a somewhat compressed down vest inside. There’s a small pocket under the main cover that has a clear plastic viewport, and the bag comes with an owner identification card that can be filled out with information like emergency contact names and phone numbers. I use it to store some of my business cards to hand out to new acquaintances when I’m on the road. The Mighty Mini has two side pockets, each with their own zipper and again using the big zipper pulls. Each of these pockets measure 130 mm (5 inches) long by 50 mm (2 inches) deep by 65 mm (2-1/2 inches) high. The sides of the bag use foam stiffeners, which helps the bag keep its shape. The bag is made from 1050 denier ballistic nylon, so it should last a long time. These pockets seem too tiny to be useful at first, but their size is deceiving. I can fit a pair of sunglasses in their case in one side, and the other pocket can hold, for example, my Olympus VN-240 digital voice recorder, which I keep to record my notes on various products that I help review while I’m traveling. I’ve found that these pockets will also hold my tiny Sony DSC-T1 digital camera with room to spare or I can just squeeze my Canon S30 digital camera inside. The Canon is an oldie but goodie, and is now relatively large compared to more modern digital cameras. At first glance, the pockets definitely did not seem like they’d hold much, but their shape again maximizes the available room. My feeling is that this is one of those “surprise and delight” features, and I get a real kick out of fitting so much in such a tiny space. Even though the Mighty Mini’s price is relatively high, I do feel like I got my money’s worth. 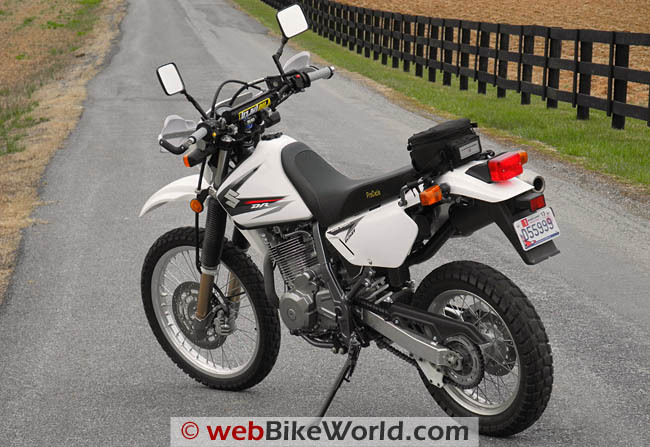 The Marsee Mighty Mini on the back of the Suzuki DR650SE (blog). There’s one more thin pocket on top, this one is not as useful as the others. It opens with a zipper and it’s about 180 mm deep (7 inches) and as wide as the bag. I can fit my camera or my sunglasses in there, but it causes a big bulge on top because the pocket doesn’t expand. This pocket has a liner between it and the bag’s lid, but is unlined otherwise. I suppose it could also hold some printed materials, but it’s too small for a map. The tank bag has the typical Marsee soft rubber-like bottom, which helps it to grip on the top of the tank and, I suppose, helps somewhat to prevent paint scratches. Paint scratches are the main drawback of using tank bags, and although some work has been done with new mounting devices, it can still be a problem. The Mighty Mini comes with a very simple mounting system, consisting of two nylon webbed straps with male nylon clips that attach to dual built-in mates located on the front and rear of the bag. 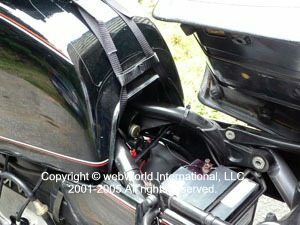 One strap is looped around the motorcycle’s headstock and one can be looped under the motorcycle’s frame at the rear of the fuel tank. The problem is that the Mighty Mini is narrow and tall, and it can rock side-to-side, even with the straps tightened up. But this isn’t really a problem, because the bag stays put. The Marsee logos on either side are treated with 3M Scotchlite, and they are reflective, but their surface area is so small, I don’t think they really help improve the visibility of the motorcycle or rider. I have to say that the Mighty Mini is one of the most useful tank bags I’ve tried. It’s cool-looking because of its — dare I say it — irresistibly cute shape. It should fit just about any size tank, and it really does hold an amazing amount of stuff, considering its size; certainly enough for a day trip. It’s made in the U.S.A. and it carries a lifetime warranty against defects in workmanship. Get one while you can! My feeling is that the newer versions don’t seem to be as useful and are much more expensive. From “J.A.” (August 2007): “Thank you for the review of the Marsee Mighty Mini Tank bag by B. K. it is exactly what I have been looking for. 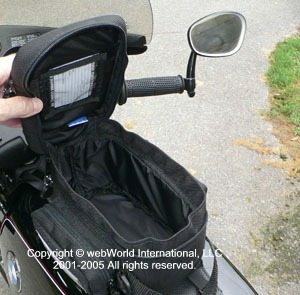 Unfortunately, I have not had any luck finding an original Marsee Mighty Mini Tank Bag. With Marsee’s decision to send the “cute” 3L bag to its untimely demise, in favor of the bloated 8L version, there seemed to be no hope finding a small yet useful tank bag. Alas, SBW Concepts has what looks close to being a clone of the original 3L Marsee bag!